More than building happens in the Blocks Interest Learning Center! Think of blocks as a form of art, where children can create items they see every day or that they see in their minds! In addition, they are a way for preschoolers to explore math, science and more! What do children learn while playing with blocks? Develop socio-emotional skills by sharing together in small groups. Increase their attention span as they build together. Express their creativity by creating houses, stores, animals and more with blocks. Develop knowledge of concepts such as length, height, weight and spatial areas. Develop cognitive skills such as classifying; sorting by shape, size, color and weight; and counting. Solve problems as they play (how can we build stairs to get to the house we just built). Develop their fine and large muscles (by lifting, grasping, moving and carrying blocks). Develop eye-hand coordination by putting blocks in specific orders or patterns. How should the teacher prepare for a Block Interest Center? There is no preparation necessary! Just have the blocks and props in the block area. The children will take it from there! Once you have a block area set up, it does not need to be moved. The children will not need suggestions or planned activities for blocks! Other than having the materials already at the interest center before the school day begins, there is no other preparation needed. Many items and props that you place here will be in the block area for a week or more to allow ample time for the children to observe the items over time. Where should the teacher place a Block Interest Center? Although there is no preparation necessary before children use a block area, where you set up your block center is important. A block should be given a large space in an area that is not a high traffic area in your classroom. The children will become very frustrated if their structure is knocked over by someone passing by. Another consideration to keep in mind when deciding where to set up your Blocks Interest Center is what other interest centers are near blocks. The block center becomes very busy and very loud! Setting this center up next to the library area would not work for those trying to look at books. 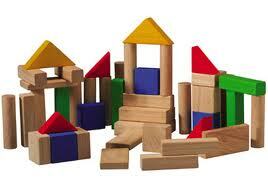 The most common and most used blocks are unit blocks (wooden blocks of different shapes and sizes) and hollow blocks. Typically, there is a shelf in the block area to store the blocks on. If you don't have shelves, not to worry! In one classroom, we used large plastic bins to put our blocks in due to a lack of shelving! Throughout the year or during different themes you can add other types of blocks such as foam blocks, colored wooden blocks, etc. In addition to blocks, add props to your block area to compliment your children's interests or to support a theme. You can add cars and trucks, animals, traffic signs or little people! One resource I simply could not do without is The Creative Curriculum by Diane Trister Dodge. I believe every classroom should have one! If your program does not have a copy, check your local library or bookstore. It is a wealth of information on interest centers and could not be more developmentally appropriate! You can purchase a copy through Amazon. Click link below to go to their website. Choose the materials to be used in the Blocks Interest Center based on the concepts you are working on with your children (counting, number recognition, sorting) or the Theme you are working on (Dinosaurs, etc.). Below is the link to my THEMES page. Under each theme, you will find suggestions for changes to the Block Interest Center for each theme!